The UAE will inaugurate three climate-resilient solar power projects in the Bahamas, Barbados, and Saint Vincent and the Grenadines this week under the $50 million UAE-Caribbean Renewable Energy Fund (UAE-CREF). The Bahamas, Barbados, and Saint Vincent and the Grenadines face some of the highest power costs in the world, due to their reliance on diesel. All three projects are designed to withstand up to 160 mile per hour winds and extreme weather, per a new requirement instituted in the UAE-CREF in the wake of Hurricanes Irma and Maria. The projects will be inaugurated by HE Bader Almatrooshi, UAE Ambassador to Cuba, Haiti, and Jamaica and Representative to the Association of Caribbean States. “By funding renewable energy solutions globally, ADFD is enabling Small Island Developing States to tackle their development challenges, meet their outlined priorities, and optimise use of their natural resources,” said Mohammed Saif Al Suwaidi, director general of ADFD, the UAE’s leading national entity for international development aid, which fully finances the UAE-CREF. In the Bahamas, which hopes to generate 30 per cent of its power needs from renewable sources by 2030, the Thomas A. Robinson National Stadium 925kW Solar PV Carport Power Plant will displace 310,000 litres of diesel per year, saving the government US$350,000 and offsetting 856 tonnes of carbon dioxide annually. The project is the largest-ever solar plant to feed into the national grid and sets a critical regulatory precedent for future private development. The project was developed in partnership with the Bahamas Ministry of Environment and Housing, with initial concept work by the Rocky Mountain Institute. In addition to power generation, it also serves as a carport with 342 parking spaces, including two spaces that are equipped with fast-charging electric vehicle charging stations. In Barbados, the government aims to generate 100 per cent of its energy from renewable sources by 2030. 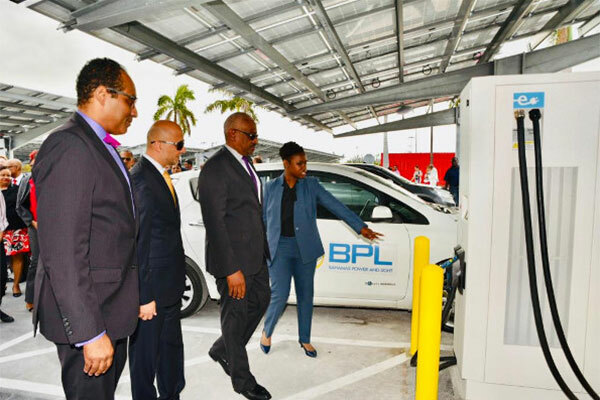 As part of this target, the Bridgetown 350kW Solar PV Carport Power Plant and Bow Manston 500kW Solar PV Power Plant in Barbados are expected to save US$381,000 per year by displacing 265,000 litres of diesel fuel and 975 tonnes of carbon annually. In Saint Vincent and the Grenadines, the project – with 600kW of solar PV and a 637 kilowatt-hour (kWh) lithium-ion battery – is unprecedently able to supply 100 per cent of Union Island’s daytime power requirements. The plant alone also meets over 30 per cent of Union Island’s energy needs and will displace 320,000 litres of diesel fuel per year, saving the island US$368,000 and offsetting 825 tonnes of carbon annually. The hybrid plant was developed in partnership with St Vincent Electricity Services Limited (VINLEC), again with initial concept support from the Rocky Mountain Institute. With its combination of solar PV and battery, the project also provides a model for high penetration of renewable energy on small outer islands, which can dramatically reduce their crippling power costs. The government has set a target to generate 60 per cent of the country’s energy from renewable sources by 2020.